Updated attendance figure 7/29, 11:30 a.m. 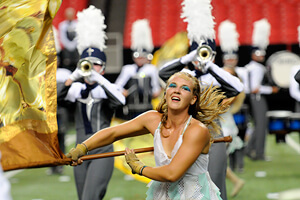 In a day that saw seven new Olympic records set in London, Drum Corps International set its own record in the former Olympic city of Atlanta, with 16,114 paid patrons witnessing the Blue Devils (93.15) take first place at the DCI Southeastern Championship, Saturday, July 28. 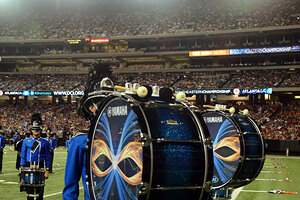 In the seven years that Drum Corps International has visited the Georgia Dome, the previous attendance record was 15,831 spectators in 2006. "It was great," Crossmen drum major Hunter Bown said about the competition. "The Georgia Dome was packed. I've attended this show for the past three years. Never seen it like that." Taking second place at the event was Carolina Crown (92.00), who saw the gap in total score between them and the Blue Devils increase by 1.15. In the captions, Carolina Crown took first in Brass and Music Effect. "We know we have something special, and so much hard work went into it this week," Carolina Crown baritone player Kevin LeBouf said about their 2012 field show, "For the Common Good." "It's not just dots on the field anymore. It's connecting with the audience. Over this week we've really learned how to perform the show we have." Blue Devils took first in all other captions, except for percussion where they finished third. Blue Devils color guard captain Rachel Silva said she's noticed a growth in crowd response since the corps revised the end of its production. "It touches my heart because we know that the crowd loves our show," she said about standing ovations. "It begins at the 50 [yard line] and everyone just sort of stands from there." Silva said as the season comes to a close, and the California-based corps travels further east, the Blue Devils will treasure their last two weeks together. "We'll definitely miss being together," she said. "Home will always be there, but this is a once in a lifetime thing." The Cadets (3rd, 90.60) took first in Percussion and jumped past Phantom Regiment (4th, 90.45), after trailing behind them since July 20. 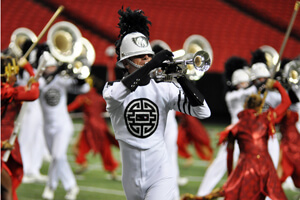 "Performing in the Georgia Dome is always a new experience," Phantom Regiment drum major Dean Patterson said. "The crowd was great. They definitely brought a lot of energy to our performance, and we try to give it back to the audience." He said they've been pleased with crowds' reactions this season to their field show, "Turnadot." 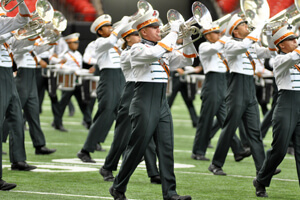 The corps debuted a new closer to the production three days ago at the DCI Southern Mississippi event in Hattiesburg, Miss., and Patterson hinted at even more changes in the works. "We'll see what changes come," he said. "We'll have to wait and see." Santa Clara Vanguard (5th, 88.85) and Bluecoats (6th, 88.20) followed behind. Making the second largest improvement in score of all 22 corps since last Saturday's DCI Southwestern Regional in San Antonio was the Boston Crusaders (7th, 86.30), who stayed ahead of the Cavaliers (8th, 85.95). The Madison Scouts (9th, 84.90), who were seventh in San Antonio last week, put more than a point between themselves and the next place corps, Spirit of Atlanta (10th, 83.40). Rounding out the top 12 were Blue Knights (11th, 82.70) and Blue Stars (12th, 81.65). "The show went pretty well," Blue Stars drum major Zack Crissman said. "We've had a couple of strong days of rehearsal. Everything we worked on was performed well. And everything we've done before was routine." Crissman said the corps' production "The Blue World" has been progressing well. "We started out with the bare skeleton of the show and put it on the field as well as we could," he said, "From there, the corps has gotten better and the show has gotten better." Blue Stars held onto 12th place, continuing to keep the Crossmen (13th, 80.20) out of the top 12. "It's a different battle every day," Bown said. "It's drum corps. And we're fighting for it." The Crossmen drum major said it was a treat to perform last week in San Antonio, where the corps is based. Bown said the corps is also excited for next weekend at the DCI Eastern Classic in Allentown, Pa. "It's like our second home," Bown said about the east coast, where the Crossmen were formerly based.